The old saying, “Eyes bigger than your stomach” rang true for one unfortunate, and severely bloated, raccoon caught in a sewer grate in the Zion suburb of Chicago Thursday afternoon. “It seems this little guy has been eating a little too well,” the Zion Police Department wrote. 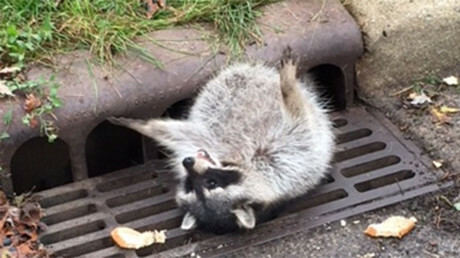 However, the raccoon (AKA trash panda, dumpster shark, ring-tailed bandit, hamburgler) proved too fat for the cops to prize out of the sewer grate on their own, so they called for backup from the Zion Public Works Department. “They were able to free him and our friend was no worse for wear,” the police department added. The adorable critter was unharmed and is undoubtedly sleeping off a deep food coma.